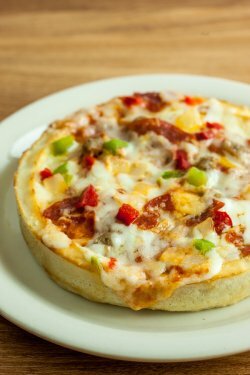 If Chicago pizza in San Jose has become a staple of your diet, you may be interested in learning a little bit about the meal. Deep-dish pizza is much different from other types of pizza, including the thin round pies typically found in New York and down the East Coast of the United States. If you are interested in learning about the components of this style of pizza as well as the materials used to make it and the best way to save it for later, read on for Chicago Deep Dish Pizza 101. Almost every kind of pizza is made up of several key components: toppings, sauce, cheese, and crust. When it comes to deep-dish pizza, sausage is a traditional component as well; however, this layer is no longer a given and is not always incorporated. One of the biggest differences between deep-dish pizza and East Coast pizza is that the sauce goes on top of the cheese rather than the other way around. The bottommost layer of a deep-dish pizza is its crust, which serves as a thin foundation for the pie. The cheese is then laid on top of the crust, followed by the now-optional sausage layer , and completed with the sauce and any other toppings you might desire. Once you have gathered all of the elements and ingredients for your deep-dish pizza, the next step is to identify the proper cookware. A deep-dish pizza requires a sturdy pan that can heat up homogenously. This pan style is similar to that of a cake pan, with short walls that support the deep crust. It helps to use a darkened pan because lighter colored pans will not absorb as much light or heat. If you do not have access to a commercial oven, you will want to use a pizza stone and sheet of aluminum foil in your oven. Avoid using any sort of speed settings on your oven to ensure that your pizza cooks evenly throughout; these settings tend to result in uneven cooking and cool spots in the center of the pie.